Secunderabad Railway station has been nominated as Eco smart station. The details of Secunderabad station, availability of amenities, existing methods of cleanliness/sanitation and action plan for improvements are furnished below. 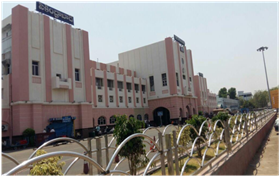 ·The station is provided with huge circulating area on both sides with nice greenery. Landscaped areas of 10926 Sq.Mts with 408 trees are maintained at the station. The station is provided with 10 platforms, 3-Foot over Bridges, 3-Lifts, 7-Escalators and adequate number of Waiting Halls and well furnished Retiring Rooms (AC & Non-AC). ·The station is provided with 8-DFMDs (Door Frame Metal Detectors) at entry points along with HHMDs (Hand Held Metal Detectors) issued to the security staff for frisking the passengers. X-ray luggage scanners of 4 numbers are also under service. For enhanced the security, hi-tech Surveillance system (CCTV system) with 86-cameras covering all sensitive areas including entry/exit points is provided. ·All the electrical fixtures in the station are of LED type. Energy efficient and 5 star rated Pumoms/Electrical appliances are installed in the station. 1. Platinum Rating (Highest rating) has been awarded in recognition of Green initiatives adopted at the station by CII & IGBC. 2. 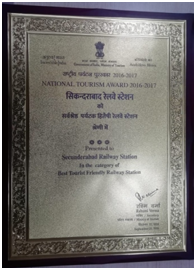 Secunderabad has been conferred “Best tourist friendly station” by Ministry of Tourism. 3. 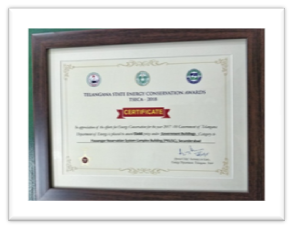 PRS building of Secunderabad station has received Gold Prize in Telangana State Energy Conservation Awards from Hon’ble Governor of Telangana State. 4. 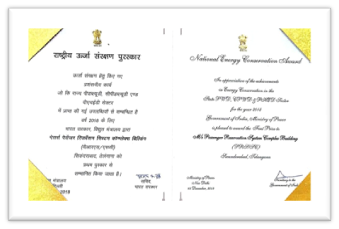 PRS building of Secunderabad station has received first prize in National Energy Conservation Awards from Ministry of Power, New Delhi. 5. Secunderabad Railway station is provided with 500 KWP solar ‘on grid’ power plant which generates 2250 units per day on an average and recording an annual savings of Rs. 66.5 Lakhs. Reserved lounge : Available on PF-1 & PF-10. SEATING CAPACITY IN PASSENGER WAITING HALLS. ·The Secunderabad Railway station is provided with Mechanized Cleaning and Housekeeping Contract for 2-years for a value of Rs. 11,23,58,153/- to M/s All Services Global Private Limited, Mumbai. ·The mechanized cleaning of the station consists of surface cleaning of all the Platforms , Station Offices, Waiting Halls, Retiring Rooms, all the sanitary amenities, Tap points, Benches & Granite column sitting arrangements, Open drains & Apron tracks cleaning and circulating area cleaning etc with trained man-power with the help of the specified machines, tools and echo friendly cleaning materials. This also includes Pest and Rodent Management of the station. ·Health Inspectors of the station take care of the cleanliness & hygiene of the entire station area round the clock. ·The station cleaning contract is being operated with 148 Cleaning Staff + 11 Supervisors in complete uniform with Protective Gear at work-place with the help of 51 cleaning machines. The details of cleaning machines deployed are as under. ·The station premises are cleaned frequently with high standard echo-friendly cleaning materials duly spraying of disinfectant deodorants after cleaning. 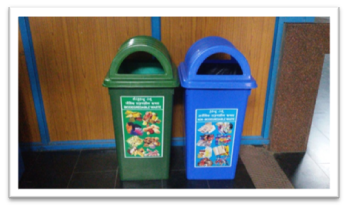 ·The station is provided with 2-bin system for collecting garbage of Bio-degradable waste in Green colour dust-bin and Non Bio-degradable waste in Blue colour dust-bin. All these dust bins are provided with pictorial stickers for easy understanding to the passengers. The dust-bins are provided with Bio-degradable poly covers of green colour for carrying of Bio-degradable waste and black colour for carrying of Non Bio-degradable waste. ·Once the dust-bin is filled to 3/4thlevel the dust-bin Bio-degradable poly cover is tagged and shifted into the truck and transshipped to centralized garbage collected location. This centralized garbage collected location is provided with 3-parts coloured with green, blue and red for collecting Bio-degradable waste, Non Bio-degradable waste and hazardous waste respectively. ·From the centralized garbage collecting location all the garbage in bio degradable bags is shifted to Municipal dumping area by the HMDA. In compliance to the directions of Hon’ble NGT, the following committees have been formed at Station level and Divisional level. The following areas are covered as a part of cleanliness and disposal of waste at SC station. (ii)Disposal of Solid Waste at Station. · Cleanliness activity at SC station has been completely outsourced. The Comprehensive Mechanized Cleaning Contract value is Rs.11,23,58,153/- for 2-years with Eco friendly cleaning Materials, Tools & Machines. This activity is monitored round the clock by Railway Supervisors. Bio-degradable and Non Bio-degradable dust bins are provided at SC station to ensure segregation of waste. 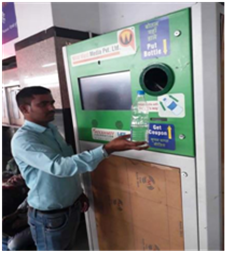 ·Awareness programmes have been organized regarding the usage of Bio-degradable and Non Bio-degradable dust bins at stations to ensure segregation of waste at source to the maximum extant. 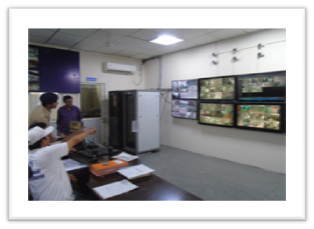 ·Monitoring of cleanliness, awareness announcements are being done through CCTVs. Biometric attendance is being followed. ·Swachh Bharat activities are being organized along with the local bodies, Bharat Scouts, School children etc at stations periodically to ensure thorough cleanliness even at unnoticed locations on regular working and to increase the awareness among the Rail users. ·Digital display of Green Initiatives has been provided at the Main Concourse on both the sides of SC station. The details of SC station, achievements and the activities taking place at SC station are being displayed for the awareness of passengers. 1.Two bin system for collection of solid waste. Collection of waste in Two-Bin system at SC Railway station has been introduced for collecting bio degradable and non bio degradable waste separately. These bins are provided at 20 meters apart on platforms with pictorial stickers clearly indicating bio degradable and non bio degradable waste items. This system is most help full for ensuring segregation of waste at source level itself. Every dust bin is provided with bio degradable poly-cover so that waste generated is handled in bio degradable covers only. After the waste is filled in the poly-covers, the filled poly-covers are sealed with tags and will be moved in trolleys to centralized dumping points without exposing the waste to open air to avoid bad smell at the surroundings. The waste generated on platforms and trains is collected in Bio-degradable bags. Such garbage filled Bio-degradable bags is transferred to a separate earmarked centralized garbage dumping place at the station in separate compartments viz biodegradable, non-bio degradable and hazardous waste, from where the local municipal authorities transships the waste to the respective places of disposal under local municipal system. 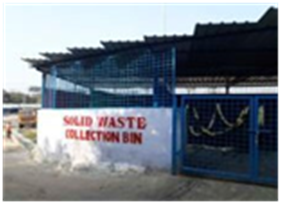 Daily around 8 tones waste is generated from SC station and is being properly disposed. Final disposal / recycling of garbage is done by local Municipal Authorities as per their norms. Water Bottle Shredding Machines (12 Nos) have been provided in order to eliminate the re-use / improper disposal of plastic empty water bottles. These are provided at different locations of Railway station for the public use. These machines are procured under CSR funds provided by M/s HAL, Hyderabad. To ensure cleanliness of trains having halt for 10 Min to 20 Min at SC station, CTS (Clean Train Station) system has been introduced and is outsourced. The contract value is Rs.4,49,73,423/- for 2-years. By this outsourced service 39 trains (339 coaches) are being cleaned daily with Echo friendly cleaning Materials, advanced Tools & Machines. To ensure perfect system of disposal of human excreta, Bio toilets are fitted in coaches in place of open chute type toilets. Out of holding of 1707 Coaches, fitment of bio toilets has been completed in 1379 coaches as on Mar 2019. The balance coaches will be completed by Dec’2019. Each bio toilet in coaches is provided with a dustbin so that the passengers can drop the waste in the dust bin instead of littering. Pictorial Stickers have been provided in the toilets as educative measures regarding the usage of Bio-toilets. To ensure cleanliness of coaches and proper collection & disposal of waste generated in coaches Mechanized cleaning of coaches has been introduced in the coaching depot. The waste is collected in Bio-degradable bags and transshipped to centralized garbage location of the depot, from where the local Municipal authorities transship the waste to the municipal dumping yard for proper disposal. Pest & Rodent Control Activity at SC station and in trains and at Secunderabad Coaching depots has been outsourced and successfully going on. ·Passengers Announcement System at station is available for educating and increasing the awareness regarding maintaining the cleanliness among the Rail users and the penalties against offenders. Anti-littering boards & posters are provided at the Railway station. ·Anti-littering drives are also being organized regularly to impose penalties against offenders. ·Rain water harvesting pits have been provided at SC station to utilize the rain water. ·Regular water treatment activities like chlorination and Bacteriological testing activities are undertaken at the SC station. 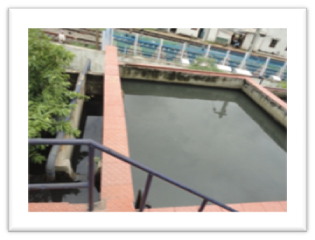 ·Effluent treatment plant of 5 lakh liters capacity is installed at SC station. The used water from various locations is collected and pumped to effluent plants for treatment. ·The treated/ recycled water is being used for cleaning of track aprons and coaches, gardening & landscaping purposes. Due to which 5 lakh liters of fresh water is saved per day. The problem of Defecation along the Railway tracks is not exists at SC station and along the approach tracks. There is no Encroachment and dumping of Waste in & around the SC station. Secunderabad Railway station is provided with 500 KWP solar ‘on grid’ power plant which generates 2250 units per day on an average and recording an annual savings of Rs. 66.5 Lakhs.All the electrical fixtures in the station are of lED type. Energy efficient and 5 star rated Pumoms/Electrical appliances are installed in the station. Public can lodge teir complaints /comments on the station cleaning through website of SCR/IR and also through SMS services. All these complaints are addressed immediately.